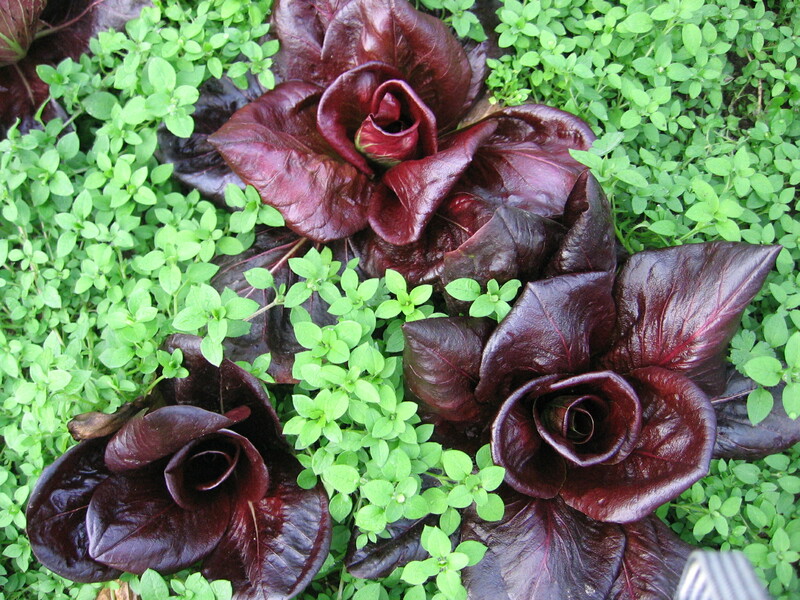 Overwintered radicchio comes back to life among chickweed in the early spring greenhouse. When planning for summer harvests we start planting in March. However, we usually have a window of mild, spring-like weather in late January/February when we could be planting a lot of hardier crops. If we couple this with the use of rowcovers and greenhouses, we should be able to get a number of crops ready for harvest in April and May, before farmers markets open and most CSA programs begin. Mike used to go to Pike Place Market year-round, and in the spring would have for sale most of the crops we plan on offering in our spring share. PLEASE NOTE: our Spring Shares are accepted by invitation only. There is no brochure or application to send you. We only have space for 50 to 65 shares each spring, so we choose those families who have proven to be the most supportive of our farm through the seasons. What produce will be included in a Spring Share? Because of shortened daylength and cold temperatures, most of these vegetables will need to be planted in late winter in order to be mature enough to harvest in April and May. But, what could be better than fresh spring greens! Many cultures relish the early spring for its bitter greens, as well as for the tender, sweet ones. Many spring vegetables are very cleansing for the body—necessary after a winter of heavier foods, holiday goodies, and reduced exercise. Some vegetables are just better early in the spring when the weather is very cool—lettuce, for example is sweet and spinach is more tender. Many vegetables are easier to grow—radishes, turnips, and arugula especially so because their insect pests haven’t hatched yet. How much produce will be in the shares each week? Each week we will strive to include at least one item from each category in the above list each week. See the chart below for an estimate of what quantity to expect in the weekly boxes. How long will the spring shares last and what will they cost? The Spring Season begins 10 weeks before the Summer Shares start—the first week of April, and will run through early June—a total of 10 weeks. The cost for a small share is $175, or about $17.00 per week. The cost of a large share is $275, or about $27 per week. You can expect each small share to feed approximately four adults—fewer if you REALLY love greens. Please see our sample chart above for quantity. This is our seventh year committing to a spring subscription program. It is very difficult to find fresh, high-quality organic produce in co-ops or supermarkets in the late winter/early spring months, and when it is available it is expensive. We attempt to fill that void.